Here are my husband and I’s favorite recipes from 2012! In no particular order…. Orechiette with Chicken Sausage and Broccoli Rabe – one of our favorite delicious and quick weeknight dinners! 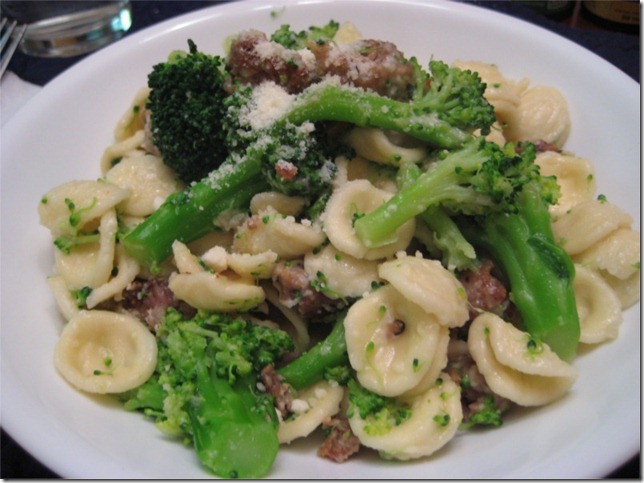 You could use any pasta shape, but the orechiette really holds in the saucy juices! 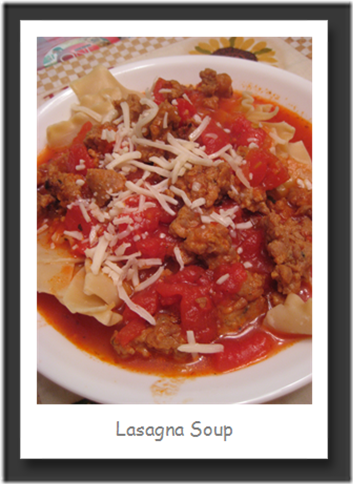 The Best Meat Sauce – sorry…I always forget to take a picture when I make this! After many trials, this has become our absolute favorite homemade spaghetti sauce! 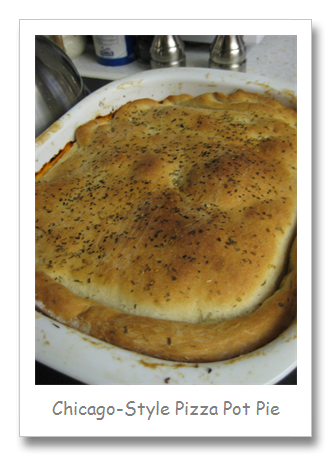 Chicago-Style Pizza Pot Pie – a delicious weeknight meal that tastes like pizza…in pot pie form! I cook the meats ahead of time, which means I just need to assemble and bake when we want to eat this! 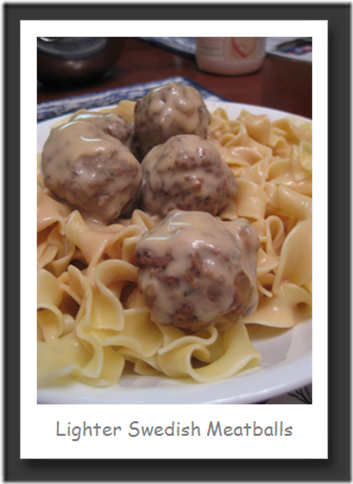 Lighter Swedish Meatballs – Ikea has NOTHIN’ on us! These are delicious, light swedish meatballs! 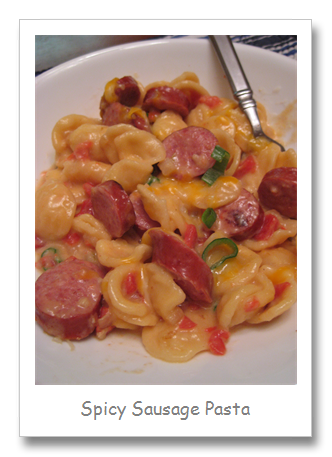 Spicy Sausage Pasta– I thought this one looked a little strange, originally, but it’s SO delicious! I find myself craving it, and we eat it regularly. I will say – the cheese is key, here. Don’t substitute what you have on hand. 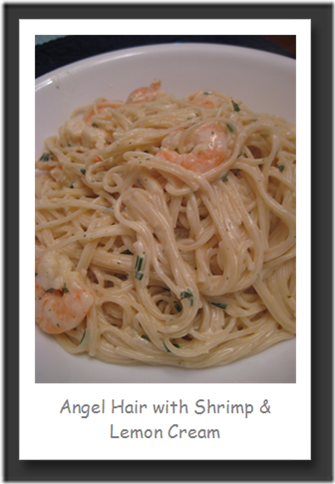 Angel Hair with Shrimp and Lemon Cream – wow – a really great meal! Quick to pull together, but fancy enough you could serve it to guests. We typically serve it with a side salad, or, steamed broccoli with a squirt of lemon juice. Simple, delicious. 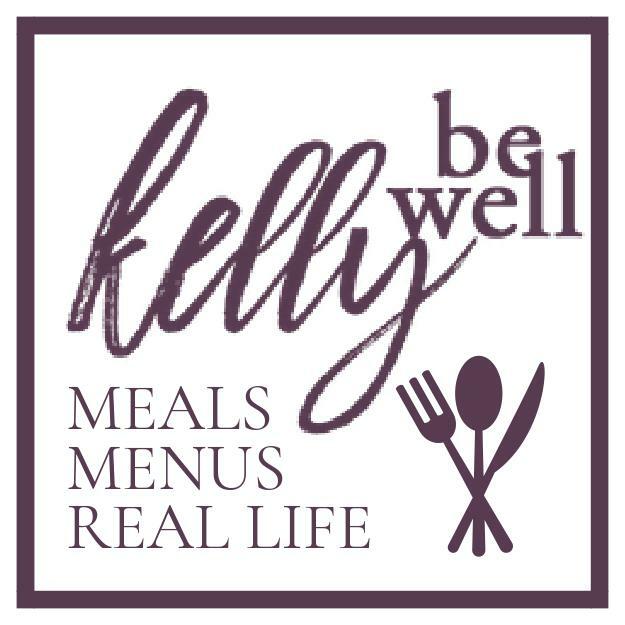 Slow Cooker Beef Brisket with Garlic Parmesan Mashed Potatoes – again, sorry, no picture! Really delicious – hubs remarked this is his absolute favorite of 2012!! 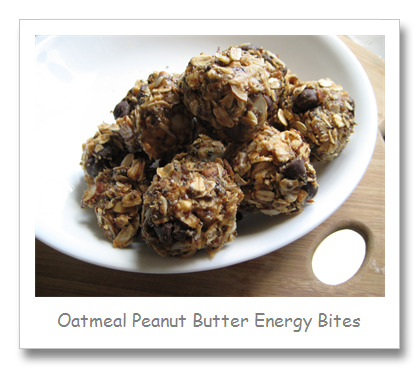 Oatmeal Peanut Butter Energy Bites – these are easy, delicious little pre-workout morsels DH and I use each week. They’re SO good and hit all your cravings with their combination of chocolate and peanut butter. I’ve also made them with white chocolate, or heath bits, and they are just as good. 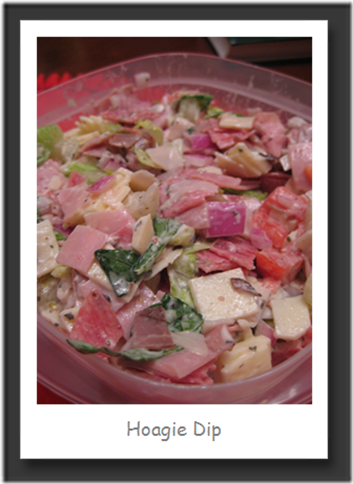 Hoagie Dip – I made this for a holiday party in December and boy, was it GOOD. Like the best sub shop from Pittsburgh or Philly – in a dip. (Well, more of a ‘spread). We even ate leftovers stuffed into good rolls like a sandwich and it was amazing! Lasagna Soup – a really great soup we’ve enjoyed many times since I first made it! 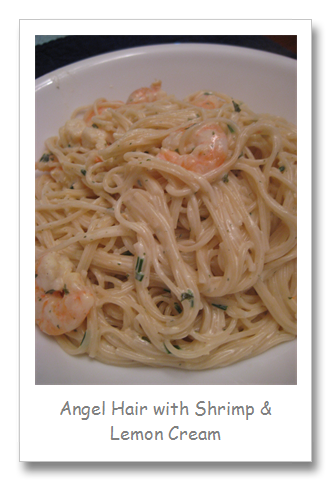 I do recommend making the noodles separately, so you can just add them as you need them for your leftovers!